File Name: Charlie Iron-Knife of Taos, New Mexico. Notes: Taos is in the north central part of the state, about 70 miles north of Santa Fe. Sunbow's Spirit had dark red skin and wore his 1984 outfit. His loin cloth was red with a white border, and he had a cream belt and chest straps. Spirit's file name was mentioned in the episode Captives of Cobra, Part 1. 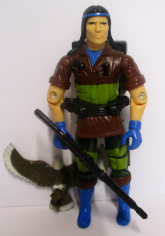 In Operation Dragonfire, Spirit had pale skin and a uniform loosely based on the 1989 outfit: a fully brown shirt and green camo pants. 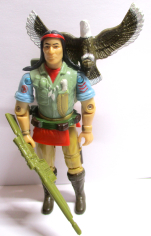 Spirit's eagle Freedom made 12 appearances in the Sunbow series, with a total of 471 seconds on screen, with animal vocalizations by Frank Welker. 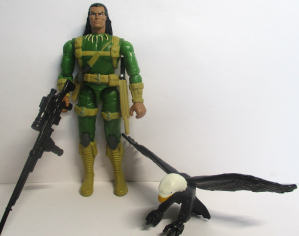 He was drawn as a bald eagle in the series proper but as a brown eagle in the Movie. The DiC series featured Freedom in 1 episode for 15 seconds, portraying him once again as a bald eagle. Accessories: light green auto-arrow rifle (new), brown and white bald eagle, fragile claws clip to arm (new, "Freedom"), green belt with red loincloth and brown pockets (new), light green backpack with molded cartridges of arrows (new). Spirit comes from a family so far below the poverty line that they never realized they were poor. Was a hunting guide through high school. Served in Southeast Asia, then as a civilian completed his education. Returned to the service for reasons inexplicable to anyone but a Native American mystic warrior. Qualified expert: M-16; M-1911A1 Auto Pistol; Remington sniper rifle. "Charlie is a Shaman, a medicine man. He's not a healer or a priest or a witch-doctor. There isn't any equivalent in our culture for what he is unless we had shrinks that could actually help people." Toy Notes: Item #6417. Featured in the Sky Hawk commercial. Accessories: black rifle (84 Spirit's), brown and white eagle (84 Spirit's, "Freedom"), black belt with brown loincloth (84 Spirit's), black backpack (84 Spirit's). SPIRIT grew up in one of the most beautiful areas of the country, the Grand Canyon. He quickly learned every square inch of the Canyon's many trails and danger spots. What set Spirit apart from the rest of his contemporaries was his uncanny ability to know exactly where he was at all times! After he enlisted in the Army, Spirit served in Southeast Asia where he was commander of scout patrols. Now, as a member of Slaughter's Marauders, Spirit's job is to lead the unit through the most hostile of combat zones to flush-out Cobra agents and bring them in for interrogation. "This indian [sic] is one tough warrior. He can smell-out the enemy from 50 miles away. His sense of direction is as reliable as the most sophisticated radar system in the armed forces. If you're on a pre-dawn mission with Spirit, in the middle of nowhere, and you haven't a clue as to how to get back to the base, just stick with him and he'll be back in time for chow." Toy Notes: Item #6560-4. Because its thumbs break so easily, this version is considered a moderately high-demand item if intact. 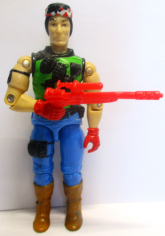 Accessories: red "lightweight Chief's assault gun" with scope (new), red, white, and blue Air Commandos Glider. SPIRIT is the ultimate Native American mystic warrior. He's a shaman of deep mystery, a peerless tracker, and a doctor of Psychology. Strapped into the frame of a stealthy G.I. Joe Air Commando glider, silently sailing the thermals and air currents over enemy territory. Spirit utilizes his tracking skills to spot barely noticeable signs of recent troop movements or camouflaged enemy bunkers. A qualified expert with most NATO small arms, Spirit is equally adept with the compound bow and throwing knife! Motto: "When the Eagle Spirit is in me, I'm the lightning from the skies. I am the thunder from the storm." Accessories: olive knife (88 Hit & Run's), black figure stand (common). Toy Notes: Exclusive to the mail offer Menace in the Wilderness, along with Budo, Big Bear, and Big Ben. Accessories: black sniper rifle with large scope, small stock, and large mount near midpoint (new), black knife with small textured grip and large silver serrated blade (new), large dark brown eagle with open mouth, white head, and extended dark brown talons (new, "Freedom"). 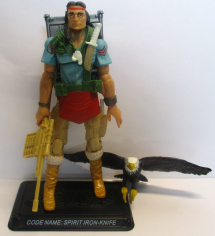 A Native American mystic warrior with a degree in psychology, SPIRIT IRON-KNIFE is also the best wilderness tracker on the G.I. JOE Team. He has an uncanny ability to find and read the faintest of all trail signs and has a keen understanding of the human thought process. This helps him not only find the COBRA forces he is tracking, but also anticipate their actions. He is a qualified expert with all the latest weapons systems available to the G.I. JOE Team but does not depend on technology. In the field, equipped with just a knife, he can create his own weapons, as well as traps, snares, and deadfalls. As effective as these devices are, he still claims that the best weapons are psychological ones. "I can carve a whistle from a hollow reed that sounds exactly like an incoming mortar round. It is very effective in the middle of the night when blown next to a COBRA encampment." Accessories: silver knife (05 Spirit Iron-Knife's). 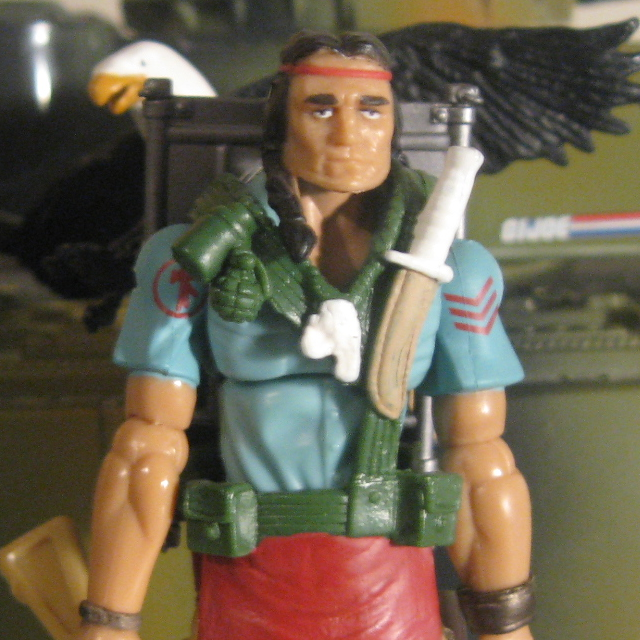 A Native American mystic warrior with a degree in psychology, SPIRIT IRON-KNIFE is also the best wilderness tracker on the G.I. JOE Team. He has an uncanny ability to find and read the faintest of trail signs and has a keen understanding of the human thinking process. This helps him not only find the COBRA forces he is tracking, but also anticipate their actions. He is a qualified expert with all the latest weapons systems available to the G.I. JOE Team but does not depend on technology. In the field, equipped with just a knife, he can create his own weapons, as well as traps, snares, and deadfalls. As effective as these devices are, he still claims that the best weapons are psychological ones. "I can carve a whistle from a hollow reed that sounds exactly like an incoming mortar round. It is very effective in the middle fo the night when blown next to a COBRA encampment." Toy Notes: Carded in a three-pack with Agent Courtney Krieger, Hannibal: Reborn, and a reprint of Devil's Due #16. Item #13023. Accessories: tan auto-arrow rifle with small scope and slot for cartridge (new), small white knife with curved handle and tan blade (new), dark brown bald eagle with spread wings, white head, and yellow beak and feet (new), silver frame backpack with posts and slots for attachments (new), pouch with three exterior pockets and handle on top, fits onto backpack (new), three tan square cartridges with six engraved arrows (new), black Joe figure stand. Spirit comes from a family so far below the poverty line that they never realized they were poor. Was a hunting guide through high school. Served in Southeast Asia, then as a civilian completed his education. Returned to the service for reasons inexplicable to anyone but a Native American mystic warrior. Qualified expert: M-16; M-1911A1 Auto Pistol; Remington marksman rifle. "Charlie is a Shaman, a medicine man. He's not a healer or a priest or a witch doctor. There just isn't any equivalent in our culture for what he is - a counselor, a warrior, and a walker between the worlds, all rolled into one."